544 pages | 2 B/W Illus. The HKP (Hong Kong Police), ‘Asia’s Finest’, is a battle-tested professional organization with strong leadership, competent staff, and deep culture. It is also a continuously learning and reforming agency in pursuit of organisational excellence. 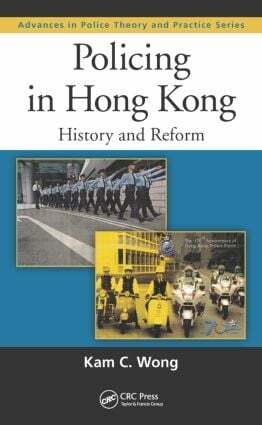 Policing in Hong Kong: History and Reform is the first and only book on the development of the Hong Kong Police from an inside out and bottom up perspective. Written by a scholar and veteran of the HKP, it is an amalgamation of indigenous theory and supporting data. Part One begins by describing the development of police studies in Hong Kong as an emerging field since the 1990s. It supplies an analytical and empirical construct of colonial policing as well as a theoretical assessment. It discusses the nature, topologies, conduct, impact, and assessment of police reform. The book demonstrates how colonial policing in Hong Kong and elsewhere takes on the community’s local color and hue in practice. Colonial policing in Hong Kong is "policing with Chinese characteristics." Part Two tracks the history of the HKP’s formation in the 1840s and examines how colonial policing in Hong Kong has changed over time. It describes the HKP’s four distinctive reform periods: the formation period (1845), the reorganisation period (1872), the modernisation period (1950s), and finally, the decolonisation period (1990s). It argues that HKP reform in the1950s was the pivotal point in transforming the HKP from a colonial force into a civil one by way of localisation, legalisation, modernisation, communalisation, and organisation. Overall, the book questions previously accepted colonial history, and in doing so, contributes to our understanding of challenges and opportunities facing HKP after the reversion of political authority from England to China. How to Conduct Police Reform? Accountable to What, Whom and How? How to Assess HKP Reform? Professor Kam C. Wong teaches at the Department of Criminal Justice, Xavier University, Cincinnati, Ohio, where he once was a chairperson. Concurrently, he is a faculty fellow at the School of Criminal Justice, SUNY–Albany, New York. An Inspector of Police with the Hong Kong Police, Dr. Wong was awarded the Commissioner’s High Commendation. Currently, he is an Honorary Fellow at the Center for Criminology at Hong Kong University. Professor Wong is a legal consultant to the Immigration and Refugee Board of Canada on Chinese law issues; an expert consultant to U.K. Beirut Police Integrity Workshop, the United Nations Office on Drugs and Crime; an expert observer at the United Nations Congress on the Prevention of Crime and the Treatment of Offenders; and an expert consultant to HKP and Ministry of Public Security, People’s Republic of China.